A trilithon (or trilith) is a structure consisting of two large vertical stones (posts) supporting a third stone set horizontally across the top (lintel). It is commonly used in the context of megalithic monuments. 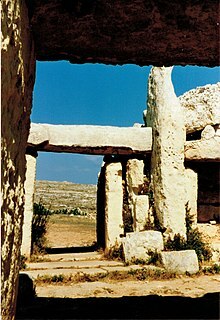 The most famous trilithons are those of Stonehenge in England, those found in the Megalithic temples of Malta, both of which are UNESCO World Heritage Sites, and the Osireion in Egypt. The word trilithon is derived from the Greek "having three stones" (τρι-/tri- 'three' + λίθος/lithos 'stone') and was first used by William Stukeley. The term also describes the groups of three stones in the Hunebed tombs of the Netherlands and the three massive stones forming part of the wall of the Roman Temple of Jupiter at Baalbek, Lebanon. Far from Europe and the Middle East, another famous trilithon is the Haʻamonga ʻa Maui in Tonga, Polynesia. The 3 blocks known as trilithon in Temple of Jupiter Baal ("Heliopolitan Zeus") in Baalbek, Lebanon. A group of three horizontally lying giant stones, which form part of the podium of the Roman Jupiter temple of Baalbek, Lebanon, are called a "Trilithon", although they do not fit the above definition. The location of the megalithic structures is atop of a hill in the region, known as Tel Baalbek. Numerous archaeological expeditions have gone to the site starting in the 19th century, primarily German and French groups, and research continued into the 20th century. Each one of these stones is 19 metres long, 4.2 metres high, 3.6 metres thick and weighs around 800 tonnes. The supporting stone layer beneath features a number of stones which weigh an estimated 350 tonnes and are 11 metres wide. In the quarry nearby, two Roman building blocks, which were intended for the same podium, surpass 1,000 tonnes. They have not been used since their extraction in ancient times. ^ Adair, Aaron. "Moving the Stones of Baalbek–The Wonders of Roman Engineering". Fleeing Nergal, Seeking Stars. Retrieved 2016-03-02.